prints. 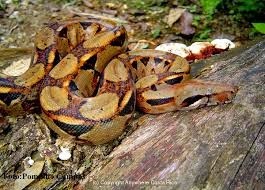 High demand for boa's skin in the past resulted in reduced number of boas in the wild. They are placed on the list of endangered animals today. 1. Boa constrictor is a large snake:- It grows throughout entire life. Boa is 2 feet long at birth, but it can grow to the length of 10-13 feet. Boa weighs more than 100 pounds. 2. Body of boa constrictor can be tan, yellow, red, pinkish or green in color:- It is covered with lines, circles, diamond-like or oval shapes. Color and body prints depend on the habitat (they provide camouflage). 3. Boa constrictor has hooked teeth:- They are not used for chewing. Teeth are used for catching of the prey. 4. Boa constrictor has heat receptors:- They uses heat receptor for detection of warm-blooded prey. Other than that, boa uses taste of smell to find its victim. Taste of smell is located on its tongue. 5. Boa constrictor is nocturnal animal:- They are usually active during the night. 6. 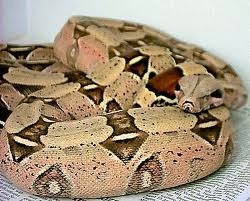 Boa constrictor can easily climb trees:- It spends part of its life in dense tree-tops. Boa is also an excellent swimmer, but it does not prefer living in the water. 7. Boa constrictor is mostly terrestrial animal:- Boa lives on the ground and moves slowly at the speed of only 1 mile per hour. 8. Boa constrictor is a carnivore:- They are meat-eaters. While they are young, boa constrictors eat smaller prey such as rats, mice and squirrels. When they reach adult size, they start to hunt and eat larger prey such as monkeys, wild boars and deer. 10. Boa constrictor is an ambush predator:- It hunts its prey using the factor of surprise. After catching the prey using its teeth, boa envelops the victim and squeezes the life out of it. It then swallows the prey in one piece. 12. 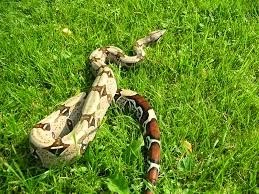 Mating season of Boa starts from April and ends in August:- When female is ready for mating, she releases specific odor to inform nearby males. Before mating, group of males wrestle to determine which one is the most dominant. Winner gets opportunity to mate. 13. Female gives birth to live babies. She can deliver up to 60 babies at a time. 14. Young boa constrictors are born with instinct to hunt:- They are left on their own from the moment of birth. 15. Life Span:- Boa constrictor can live between 20 to 30 years in the wild.